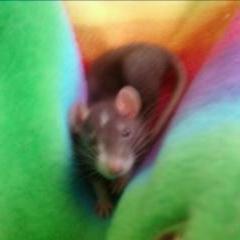 Here you can find testimonials from people who have adopted from Ravencharm Rattery. If you have adopted from me and wish you add yours (with or without pictures), please contact me. 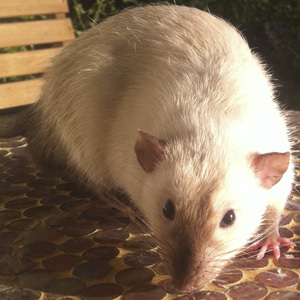 I adopted two female rats from you a little more than a year ago, in October of 2014. 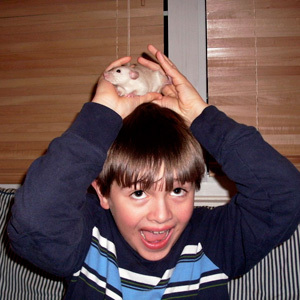 I'm glad to see that you are continuing to breed rats! 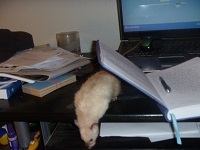 And I wanted to let you know again just how terrific my two Ravencharm ratties continue to be. They are wonderful, happy and healthy girls. 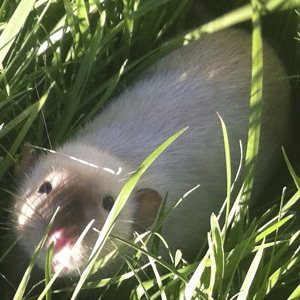 Ruckus in particular (I believe you had named her Ena) is a joy. Friendly, gentle and oh so soft, she charms everyone that she meets. Her half sister, now named Mayhem, is the unflappable one, adopting quietly to every situation. Both are doing great and have had no health issues. 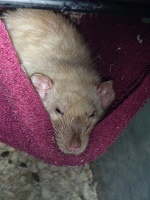 Ruckus in particular is an exceptional rat. Her demeanor is consistently friendly, interested and intelligent. Her fur is unusually soft and always sweet smelling. 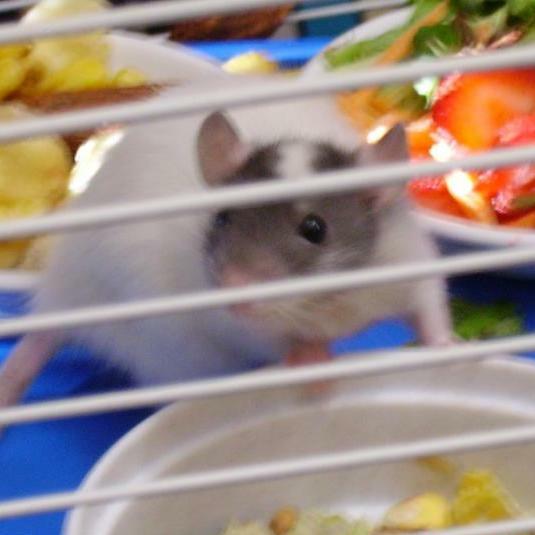 She is my "rat ambassador": People who professed discomfort with rats are nearly always charmed into reconsidering their opinions by her. Ruckus is always very gentle and calm. She is terrific with kids, even little ones who can't always be trusted to be terrific with her. And on top of all of that, she is also exceptionally cute. I've directed interested individuals to your site - I do hope that you have enough business to keep up your fine breeding! Thank you for my two girls! 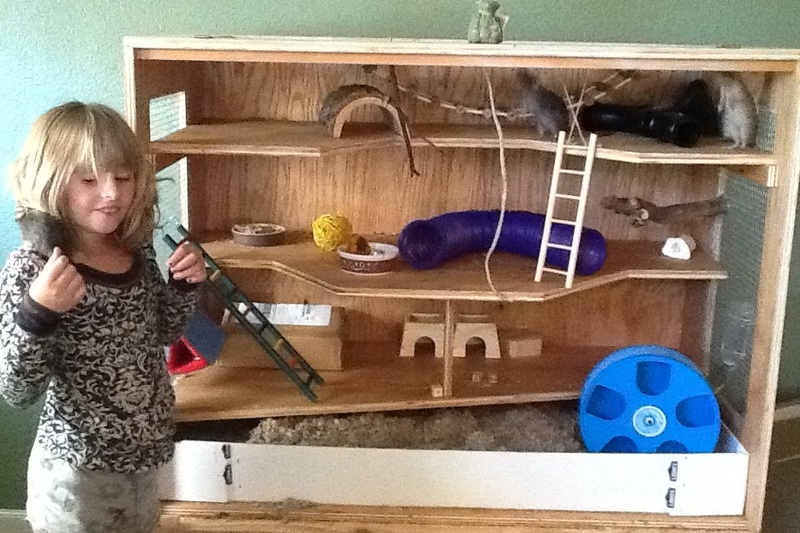 Here is a picture of Morgan with Cuddley on her shoulder...you can see Dumbo and Jumpy on the top shelf...they just finished out of cage play time and Naya Nuki (we are reading a book about her...she is an Indian girl who escaped captivity..no one has escaped the cage of course but Naya was the one who figured out how to get out of the play area one day for a brief moment of excitement :). 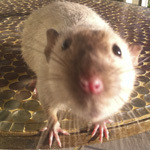 Morgan is thrilled w her rat friends and frequently tells us how much better they are as pets than a dog would have been. And, building the cage with dad and uncle was a fun experience, too. Life is good -- thank you! Hope you are well! Sorry it took so long my camera has been missing. 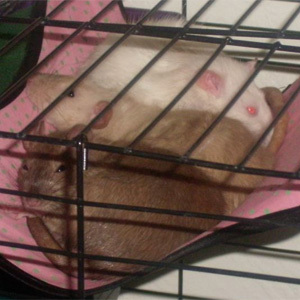 Yesterday Mocha and Latte came out on their cage on their own! Here are some pictures of them for you. The picture of Mocha out is this morning I was doing some stuff and he comes waltzing down the ramp like he owned the place and started checking everything out. 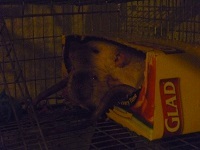 Just wanted to send you an update saying how much we enjoy the two rats we got from Ravencharm Rattery! 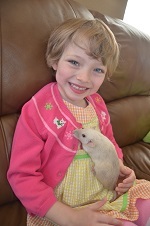 Here is my daughter Addeline with our rat Bloom. We named her sister rat Posey. 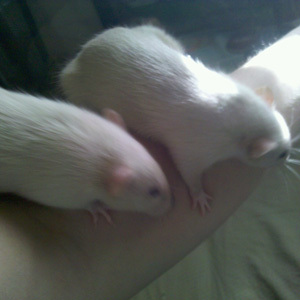 They are the best rats I've ever had. Very healthy and happy. 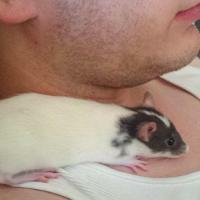 Bloom is definitely the dominant rat, but they get along really well and snuggle together to sleep at night. They are very good and patient with my girls and we just love them to bits. 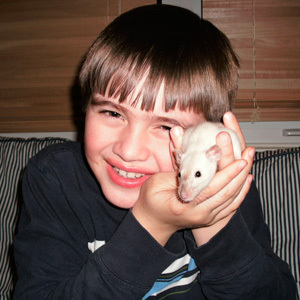 Thanks for helping us find such great pets! Happy Spring! Tanya! Trixie is doing great! Playful, getting so big! 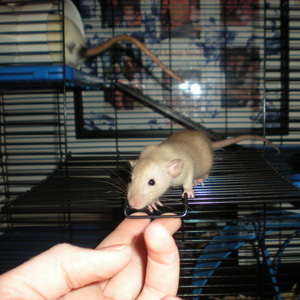 We got her another playmate, and Ruby, the scardy rat, has really come a long way as well. I think Trixie is to blame for helping Ruby feel more comfortable with us. Copyright © 2011 Ravencharm. All Rights Reserved.